Scientists have discovered what's believed to be an immense crater far below Greenland's ice sheet, NASA announced Monday. 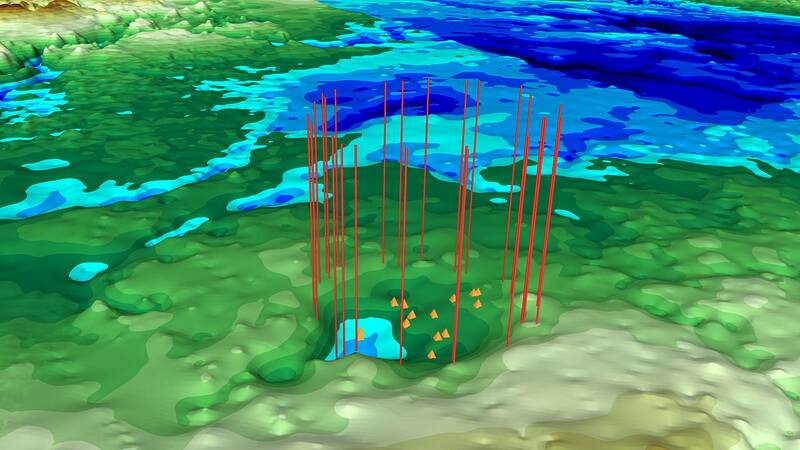 If the discovery is confirmed, the 23-mile-wide feature — a shallow, bowl-shaped depression in the bedrock under more than a mile of ice — would be only the second impact crater discovered under one of Earth's ice sheets. It would also be the 22nd-largest impact crater found on the planet. The announcement comes just months after another team of scientists announced that they had found a 19-mile-wide impact crater not far away under Greenland's Hiawatha glacier. "Once we knew from Hiawatha that there could be craters under ice sheets, it was quite easy to find the next one using an ensemble of publicly available NASA data," Joe MacGregor, a glaciologist at the space agency's Goddard Space Flight Center in Greenbelt, Maryland, and the scientist credited with making the new discovery, told NBC News in an email. "That's exciting and should motivate others to go looking for more." MacGregor, who is a co-author of apaper describing the find that was published Monday in the journal Geophysical Research Letters, was also a member of the team of scientists who discovered the Hiawatha crater. After the discovery of the Hiawatha crater, MacGregor checked topographic maps and satellite imagery to see if there might be other craters in the area — and discovered the bowl-shaped feature about 114 miles southeast of the Hiawatha crater. The presence of the feature was confirmed with data obtained from Operation IceBridge, an ongoing NASA mission in which aircraft fly over polar regions to map changes in the ice below. But other experts aren't so sure that the feature found under the ice is an impact crater. "Hundreds of possible impact craters and unlikely circular structures exist on Earth, exposed to the surface or buried (under sediments or ice), but it is a long and tedious process to confirm them," Ludovic Ferriere, curator of the meteorite collection at the Natural History Museum in Vienna, Austria, and an expert on impact craters, said in an email. Ferriere called the research speculative, adding that the only way to know for sure that a crater-like feature was caused by an impact is to do field work or to drill into the feature to obtain core samples that would show evidence of an impact. MacGregor agreed that drilling would likely be required to confirm the discovery. "It's a long road toward definitively confirming that this structure is an impact crater," he said, adding that there weren't yet any plans to conduct such research. The researchers are unsure how old the crater is, but they estimated that it formed between 100,000 and 100 million years ago. As for the space rock that would have been needed to make such a large crater, MacGregor said it might have been a mile across. Want more stories about the asteroids and impact craters?